Since people first discovered the pleasure and joy of competition they have been placing bets of one form or another. There is evidence to suggest that as long ago as 4,000 B.C. man raced horses against one another, and the history of modern racing come directly from the 1600s when the aristocracy were fond of pitting their preferred horses against the horses of other nobles. It is doubtful that Charles II, the father of modern horse racing, had even considered the complexities of a Trixie. Any who have more than a cursory acquaintance with the betting side of equestrian sport, will know that there are bets of many variety. This can be both comforting and confusing, especially if you're the type of punter who has become quite frustrated with the limitations of the basic 'win' or 'place' wagers which are are the easiest to grasp, and which are also the ones which yield the worst profit margin. Many newcomers to the sport can take comfort that not all bets require a detailed knowledge of the myriad aspects which inform the outcome of a race or more. The fact that there are straightforward bets, like a 'place' or 'win', allow the newcomer and dabbler alike to experience all the excitement of a true British racing fixture without feeling left out. But the more serious punter, those who plan to make a hobby or habit of their love for choosing the right horses, are offered a wealth of options besides the basic wagers. A Trixie is just one of the many kinds of bet which tests a punters knowledge and experience. The fundamental problem for a newcomer taking on a bet like the Trixie, which is not the most difficult by far, but does require a fair amount of skill and knowledge, is that there are so many factors to be considered before being able to have any kind of chance of succeeding. It should go without saying, that, as a rule of thumb, the riskier and more difficult the bet, and therefore the worse the chance of it winning, the better the odds are for the punter. This is where handicapping comes in. Handicapping is the much debated art of trying to predict the winner or more of one or more races. This forecasting is based on a detailed examination of all the factors which can influence the outcome. Many punters will focus on certain areas like horse and track, while some will try to work out all possible factors, not matter how insignificant they may seem. 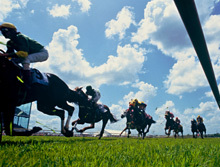 Just some of the factors which are typically considered are the type of course, whether the turf is muddy, the length of it and the quirks of the track, perhaps whether it is a left hand track or right; then these factors are calculated against the strengths of individual horses and riders, and possibly their trainers. To have a grasp of these factors in order to take a serious bet, you need to be focussed and attuned. 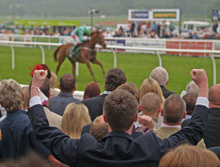 There is no point in just taking a bet which relies on the outcome of more than one race until your guess is educated. The harder and more complex the bet, the more informed the punter should be. Aside from having the history of the horse and trainer in mind, the serious punter attempting a big bet will recall the success of the horse on similar tracks and of races of similar distance. Of course, if the horse has successes a few times, he's is likely to be a favourite. This is when the chance for the serious punter comes into play, especially if they are betting with a bookmaker and not the tote. The latter pools the bets and odds change right up to the start of the race, but the bookmakers set their own odds and when the bet is placed it is taken at the odds at the time, even if they change before the start of the race. The aware punter, who is intent on applying skill and intelligence to their Goliath or Super Yankee, other major bets, will have a look at the best bookmaker odds and place a bet accordingly. Since bookmakers odds can vary a little, and since there is often a discrepancy between the accepted favourite and the 'true' favourite there is much room for the knowing punter to make an intelligent bet. This is what is called a 'value' bet, and is not always possible, but it is one of those special things which a smart punter will wait for; and when they appear and all the information falls in line, then a bet like the Trixie will be something of an imperative for anyone who knows what kind of dividends it can pay. Perhaps it's proper to point out exactly what a Trixie consist of. Bear in mind that there are easier bets and others which are so intimidating that even the most seasoned odds players and bettors don’t take them. This bet covers three sections, which are all in different races. In total this bet is really made up of four bets, namely three doubles and a treble. Since it's hard to guess the outcomes of a double on its own, not to mention the added difficulty of treble, it should be fairly clear how difficult this bet can be, even for the most knowledgeable punter. But the rewards can be great, and, which is just as important, quite satisfying to get it right.